I'm very excited to announce that I'll be playing Hermione in The Winter's Tale and we are opening this weekend! I've wanted to play her since we did the production back when I was in Drama School. The Fools & Kings Project is a wonderful company that is dedicated to making theatre accessible in NYC and has therefore created a fast paced and enticing production that is FREE and open to the public. The stages are set in Central Park and at the Riverbank State Park Amphitheater. With the weather so welcoming, this is the perfect time to come enjoy some Shakespeare in the sun. Picnicking encouraged! Dates and locations bellow. Hope to see you there. Wooohoo! I passed my re-certification in Unarmed & Rapier and Dagger. I've been super lucky to have gotten an invitation to David J. Brimmer and Dan O'Driscoll's Stage Combat classes and I've had the best time being beaten to pulp! They've certainly kicked my arse- very safely, of course. I'm excited to keep honing my skills and I couldn't have had more knowledgable teachers. Staged Reading for NY Madness this Sunday! I will be doing a staged reading of the main character in Judith Leora's piece SPF 1000 for Black Hole Madness! A Madness production co-produced with guest theatre company The Navigators. SPF 1000 is a story about a woman (me!) who refuses to leave her apartment after having a mental break due to information overload. A cutting commentary on how it becomes all too difficult to take action in the face of overwhelm. Directed by the always lovely Rebecca Nyahay. Join us at the Kraine Theatre in the East Village this Sunday from 8-11pm! "Relentless Optimist" is on Sunday Night Stories! My friend and colleague Emily Wilden runs a lovely podcast in Cardiff, Wales. It's called Sunday Night Stories... and she asked me to contribute! Check out my story "Relentless Optimist", inspired by a true event and narrated by yours truly. This story has defined a lot of who I am as a person and artist. Thank you for listening! And if you like it... Show Emily some love by liking her Sunday Night Stories page on FB. I will be performing in the debut presentation of Renegade: The Fox of Wall Street. The Victoria Woodhull Story is directed by David Marquez and written by Pennie Diamond Quintana. This is an exciting screen play about the first woman on wall street- before women were even allowed to run investment firms. I get to play 5 awesome characters including Susan B. Anthony, a stuttering Margaret and several others. It's going to be a blast. The cast is talented and there will be wine and cheese! Join us at Michael Howard Studios from 3:30-6 with a cocktail reception to follow! One week into my month long stay in London and I've booked a commercial! Here is a sneak peek of some BTS shots. Going to the gym always pays! I love that I booked this gig because the gym manager noticed I was in there every day first thing and complimented me on my workout ethic. I mentioned I was an actor and by the next day corporate had reached out to make a deal. You never know how your hard work will pay off, but it certainly did this time. We sold out our run of Quotidian! I am so proud of our entire team at the Primitive Grace Theatre Ensemble. Putting up a show is a challenge and to have a sold out run is definitely a victory! Quotidian was a show about identity and the passing of time. It was quite an experience to perform and share a true story based on your own life in such an intimate setting. It was powerful to explore the differences and similarities between creating a character versus personal storytelling. I am very grateful to have gotten this opportunity. Here are some fun BTS of rehearsal and thank you so much to those that came out and I hope to see you at the next show! Get to know the Primitive Grace Theatre Ensemble! We've sold out our opening night and tickets are going fast. I would love to share Quotidian with you so, if you plan on coming, get your ticket today here! If you want a little sneak peak, check out this video of co-artistic directors David Zayas and Paul Calderon, speaking on our newest production. It's been a month of film festivals! I can honestly say it's been an incredible learning opportunity and super fun... as you can probably tell from my ridiculously large smiles in the photos. The Primitive Grace Theatre Ensemble reads new original works every other week at Access theatre and is continuing to grow every time we meet. The idea is that as a company we continue to explore Lorca's concept of Duende. Duende contains a least these four elements: an irrationality, an earthiness, a heightened awareness of death and a dash of the diabolical. Primitive Grace wants to bring this force to more theatre in order to shift the audience´s paradigm so they will experience reality in a new, profound life altering way. I am grateful to be part of such a hard working and creative company. Here is a photo of me reading an original piece! Last year I produced a trilogy of short films alongside Martha Frances Williams at Bad Mofo Productions and now we are screening at the Queens World Film Festival! Check out the festival here and come see our showing if you can. A Woman Walks Into A Bar... is done! Yes, we hit our deadline! I'm leaving for SxSW at the end of this week and I wanted to have A Woman Walks Into A Bar 100% done, and it is. Woohoo! A Woman Walks Into A Bar is coming along very nicely! We've got picture lock and we've moved on to sound, folley, ADR and scoring. Here are some BTS working with the magnificent John Nathans and fellow actor Tim Anderson. Filmmaking is the ultimate team sport and it is so exciting to see a project coming together. Today I get to be one of those mysterious pretty people in Sunglasses Commercials. 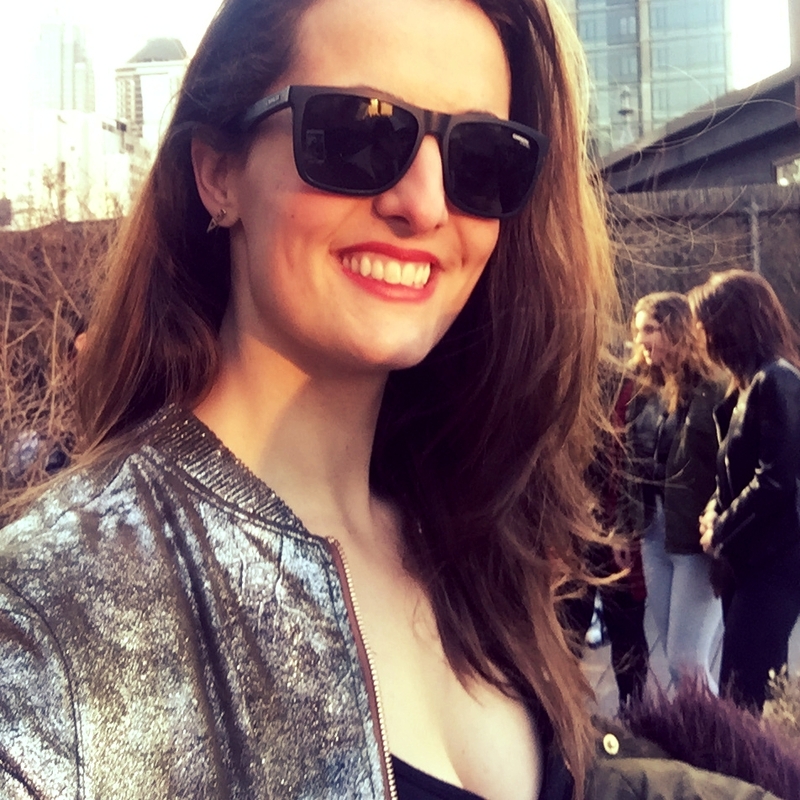 Here we are dancing till the sun goes down on a New York Rooftop all stylishly wearing Italian Designer Eyewear. I do feel very cool wearing these Carrera Sunglasses! I love creating my own work and what better way to add excitement to the year than by writing, directing, producing and staring in my own short film! 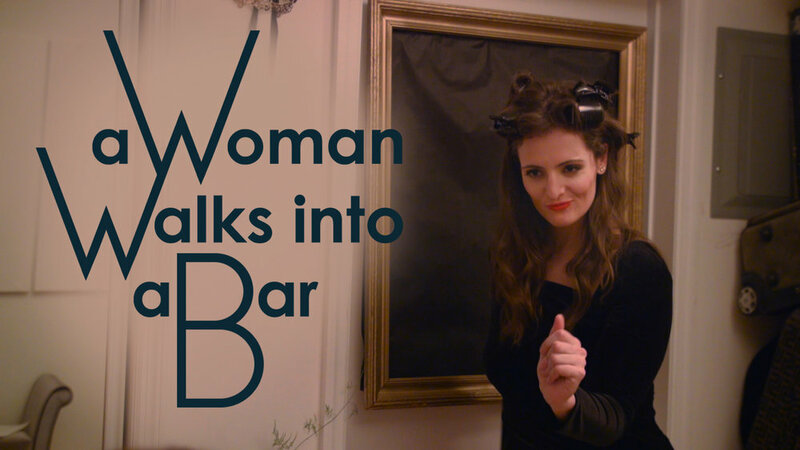 Today we wrapped A WOMAN WALKS INTO A BAR, a short film based on some of my excellent dating experiences in NY. Well... excellent for screenplays that is. I had an amazing cast and crew of 14 people who hustled their butts off to shoot a 8 pages in 12 hours. We had a blast and I couldn't be happier! Check out some of our BTS! Many thanks to Congested Cat Productions for another great screening of our short film Greener! 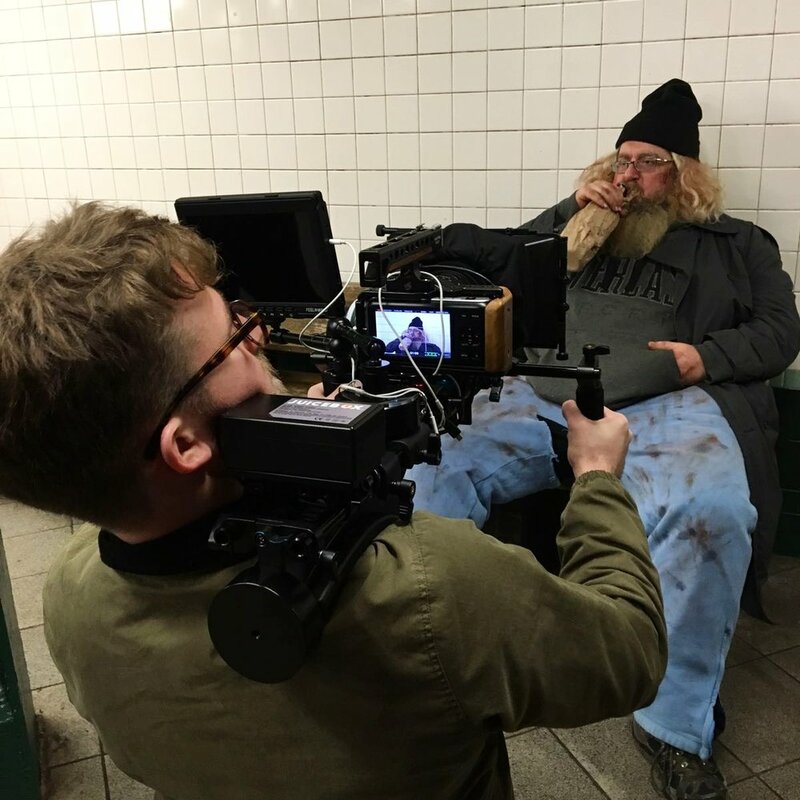 Congested Cat runs IndieWorks where they screen short films produced by emerging filmmakers throughout New York. It is a great platform for filmmakers to showcase their work in front of an audience and network with individuals in the film community. In fact, the team and I did a Q&A about our process and production. Check out our panel starting at 8:30 in the video bellow! Upcoming: Santa Fe Film Festival Screening! Come join us tomorrow night for readings, music and fun!